We are one of few practices to achieve AIUM Accreditation in the Milwaukee metropolitan area and the state of Wisconsin. "If your doctor's practice or ultrasound department has received AIUM accreditation, it means that the practice has achieved a significant milestone in relation to patient care...AIUM accreditation means that the practice meets nationally accepted standards of patient care, demonstrates consistent excellence, and is current with the latest ultrasound technology." If you come to us with pelvic pain, abnormal bleeding, heavy or painful periods, post-menopausal bleeding, or any other problems - we use ultrasound to help accurately diagnose the causes of these issues within the uterus or ovaries. In early pregnancy you may have pain, bleeding or may not be sure when you became pregnant. 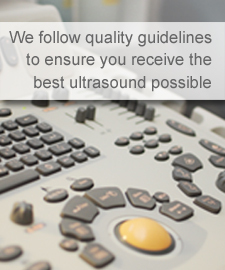 Through ultrasound we can check the health of your baby and calculate the due date. In the second and third trimesters, we complete a full survey of the baby to screen for any problems. We can also reveal the baby’s gender, if desired. 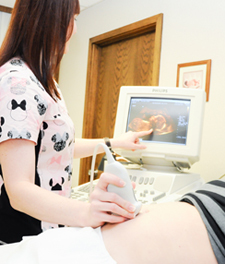 Bring in a CD (CD-R format) for your pregnancy ultrasounds so we can save your baby's images on disc for you. Jamie received her training in the Milwaukee Wheaton Franciscan hospital system at St. Francis' - School of Diagnostic Medical Sonography and has worked at Milwaukee Ob-Gyn since 2006.